October! While I write this it is freshly October. It feels like October, it smells like October, there are pumpkins everywhere (and Christmas Decorations at the stores! BUT let’s not get me started on that.) By the time is post is live and you are reading it I bet it will be 80 degrees again, BUT let’s focus on FALL and the fact that it is here! Fall and Winter are a time to get cozy, to drink hot beverages and to relax. People can’t hibernate the way bears do but I personally get pretty close. 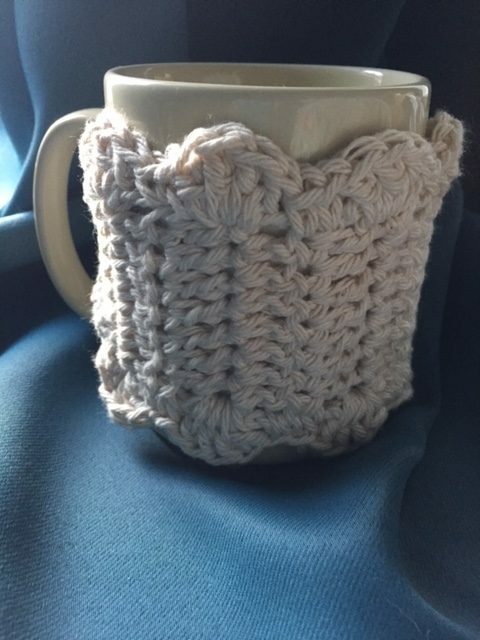 To help enjoy this time in I designed this easy mug cozy! It’s easy to make, with some room for errors, and would be a great gift or craft sale item. You can even make several from one small skein of cotton yarn. You could also use wool, or whatever your heart desires. In the photos, this is on a standard mug, but I have used it on a large mug, a triangular style mug, and it fits all of them. It is too large for my small vintage mugs, but let’s be honest, they don’t hold enough coffee or tea anyway. 1-inch button. Be sure to test, if your gauge is looser or tighter you may need a different size. The one in the photo is a vintage/antique mother of pearl button, but any fun (or boring) button will work. All chains at the beginning of a row count as a DC. So you’ll be skipping that first DC space and counting your chain as being there. You’ll also count your chain as a DC at the end of row stitch counts. If your stitches for the border are off a little bit it won’t matter much! The cozy will still look great, so there is a little room for error. Repeat row 2 13 times for a total of 14 rows, and about 8″ of work. Ch 1 turn and sc in next dc around the corner You will now be working around the outside edge of the entire piece. *4 dc in next stitch or space to create shell, 1 sc in each of next 2 sc, skip one space. Repeat pattern around the corner, down one long side, and to the edge of the next short side, ending with a shell near or at the corner space. Continue border starting with a shell stitch. Join to first SC of the border row. Using a mug to find placement, wrap the cozy around and sew button to align with the buttonhole. 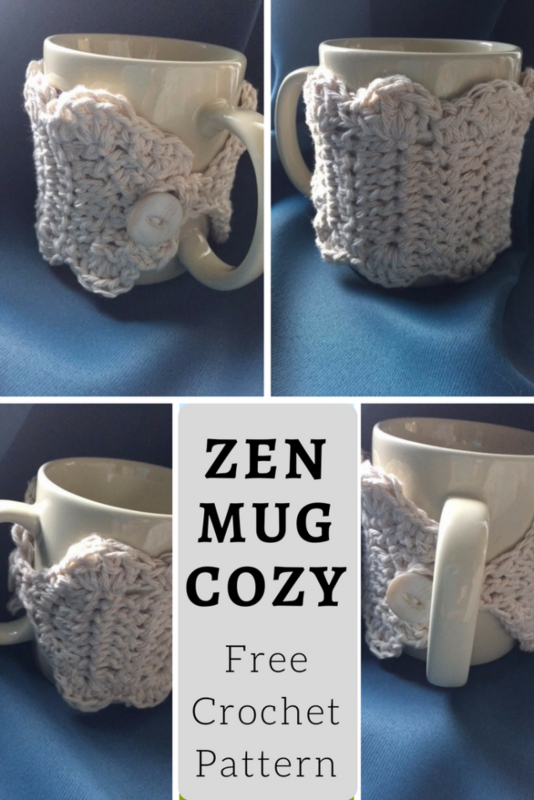 The cozy should be loosely crocheted enough that it can fit a variety of mugs by stretching or shrinking a bit. This is such a cute little thing! I love it! There aren’t a lot of people who think of this… I most of the time burn my hands when I have a cup of coffee or tea at home. This is the best solution. Thank you for sharing this! Love love love it! I’m glad you love it! If you have any problems at all let me know!